For the past seven years, Silence has hosted a regular, unbroken cycle of Morning Music sessions on Mondays, fifty-two weeks a year. The inclusive gathering is open to anyone regardless of musical training or background. Sitting in a circle, participants are asked to listen to what is emerging and contribute to the improvisation through experimentation and exploration. The emerging soundscapes span the sonic spectrum from the mild to the wild. 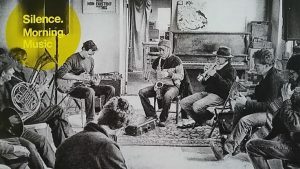 During the opening of the Guelph Jazz Festival, and as part of Silence’s commitment to risk-taking improvisatory practices, anyone is welcome to bring or borrow an instrument and experience the unfolding nature of Morning Music … in the Evening. The invitation is simply to listen well, take risks, play in the moment. A core grouping from the regular Morning Music sessions will be present to animate and facilitate. Listeners and artists from other media are more than welcome to attend and contribute.